OK, so it’s been a couple of weeks since the release of Star Wars and I’ve been holding off on my review but I feel now is the time to go ahead and post it now. So if you still haven’t yet seen it, do not read any further as it will be filled with spoilers. Ok, you’ve been warned, now on to the review. The movie was good and I was entertained thoroughly; however, I felt a like I was watching and upgrade to Episode IV “A New Hope”. To start, the Plot: I just felt that the entire movie was a repeat of Star Wars: A New Hope with bits and pieces of other episodes worked it. If Disney wants to start a new trilogy, I hope the next ones will not contain similar story lines as the previous stories. I’ll explain in other segments later as I dig in deeper. Basically, the plot of the story Poe contains a piece of a map to the location of Luke Skywalker and Kylo Ren and the First Order is looking for it. Well, is that a little similar? Wasn’t in A New Hope Darth Vader was looking for the plans for the Death Star? Again, similar plots here. So they chase all over the galaxy for the map. Oh, and don't forget, it all started with Kylo searching for Luke and in the IV, Leia is looking for Obi Wan. I guess just another in search of a Jedi coincidence. Another important similarity is the object of the resistance. In a New Hope, we have the Death Star and in the Force Awakens, we have the Starkiller Base. All in all, it is the same thing in part IV, object was to destroy the Death Star by a small opening and again in VII we have them trying to destroy an even bigger Starkiller base. Now, here is where I said earlier that other episodes tie in. In episode VI, you have the Millennium Falcon fly inside the Death Star to blow up the core and in VII, we see the Poe fly in a tight hole and blow up power cores inside and then fly out. 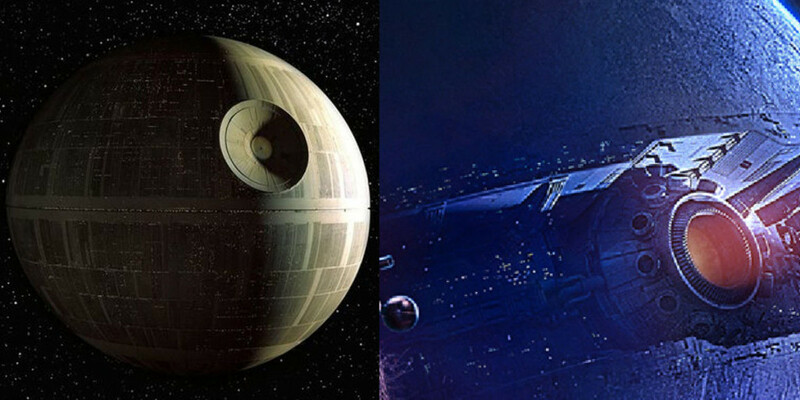 Again, here are my similarities but maybe I’m just being too picky but in the end, by both doing that, both the Death Star and Starkiller Base both are destroyed. Ray – Well this left a lot of questions of where she came from but she has to berelated to either Luke or Leia because they were the only ones that were supposed to be the last ones with the force but that is still a mystery for now. Anyway, another similarity to A New Hope, how do we get introduced to Luke originally? A droid R2D2 wonders off and gets sold to Luke’s uncle and we are introduced to Luke. Well, we are introduced to Ray by BB-8 setting off after the attack in his village. We are introduced to Ray when he is captured. 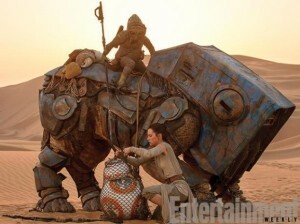 Again, just like R2D2 was captured in a New Hope. Also, I felt there is just too much of a coincidence that she has all the Skywalker Traits, such as: Already able to pilot a space craft or speeder, grew up on a desert planet, wants to join the resistance (for Luke was the Rebel Alliance and Anakin was to be a Jedi) and finally, all seemed to have a powerful presence of the force. But again, just all seems to have a repeat of how each main character gets started. Can we get a different start? Finn: Well, not much on Finn but from what I see in the character, I see Finn as the new Han Solo. He seems like Han as Finn looks out for himself at first until the moment a hero is needed. Well, that seems just like Han wanting the reward for the rescue but not wanting to risk his life. All through the movie, Finn wants to get as far from the First Order and Ren as much as possible but comes through in the end to help rescue Ray. Sound familiar? Wasn’t it Han that chose to back out of the attack on the Death Star until the last minute when he saves Luke from Darth Vader so that he could fire his torpedoes in the 2 meter wide target? Again, just a little too much similarity in both characters. In each trilogy, one of the casts has to die off. In Episode I, we see Qui Gon killed, In Episode IV, Obi Wan is killed and now in Episode VII, Han Solo dies. Maybe this is by design, but again, just too many similarities. Now there are somethings we will have to wait on but I feel like somewhere in the new trilogy we are going to see someone related to someone so to speak. Whether it be Ray is Luke’s daughter or she is related somehow to Leia, either way, she has a powerful use of the Force without even knowing much about it. Another stolen part from Episode III, we see at the end, the Emperor must rescue Anakin to create Dart Vader and complete his training. In VII, we see the new villain Snoke, needing to rescue Kylo Ren to complete his training. The movie in its entirety was good, don’t get me wrong. It was entertaining and it was all in all fun to watch; but deep down, there were just some things about the movie that just didn’t sit well with me. For instance, I felt it left way too many questions surrounding Ray. How is it that someone who has never used the force can suddenly use it so quickly? How is it that Ren can use the force so effectively but yet can’t use the lightsaber like all other Jedi’s? Now my biggest one is that I thought Darth Vader was to bring balance to the force and did in episode VI in his death by killing the emperor and in this film we have a new villain other than Kylo Ren and that is Snoke? How did all this come about from VI to VII? Just too many questions. The Music – Ok, yes this one is a little too picky but in the end, I could really tell a difference in the music sequences from the older trilogies. In episodes I-VI, you can tell Lucas kept a consistent sound track all the way through each film. Even down to the action sequences. I just felt Disney tried to introduce a different soundtrack. That’s ok but to me, there are some things I like to keep the same through the franchise, but that’s just me. The background scenes – You can almost notice the CGI in the backgrounds and the effects. Yes, they used them in I-III but I’m referring to how the designs were. In the Lucas films, you can see a much different design to try to make it look more modern but I felt they looked less real as they did in the older ones. Just saying and maybe that is just me but if I didn’t know who directed it, I still would be able to tell someone else directed and produced this movie. Well, that is my review so far and I have other details I could share but for now, I’m just curious if you felt the same way?